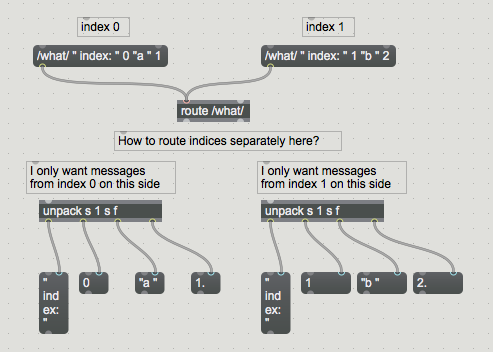 I have referred to the helpfile and I still cannot figure out how route the indices separately. The incoming messages are not in the standard ***/****/**** format, instead having a /object/ " index: " 0, which is new to me. I can see that strings are coming through. It's at the point of " index: " where I need to separate them. Interesting. 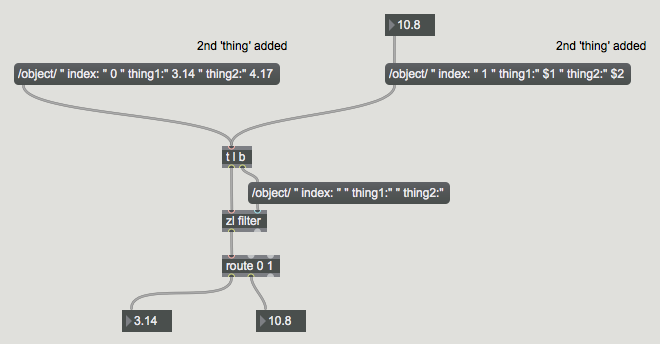 What is the OSC-route object? Did you try the normal route object instead? That's not a proper OSC message. I guess I'd use [zl filter] to take the symbols out, and then route the resulting list based on the index number. I'm not sure. I asked on the facebook group and I was led to believe that the answer may lie in OSC-route. Basically, I want to split it so that I can tap the messages for each individual index. Maybe I'm missing something fundamental here. Eg two indices incoming at once. How to split? Ok I understand. So i would suggest, you make several instances of route after routing /object/. Thanks LEN. The patch you posted works in isolation. 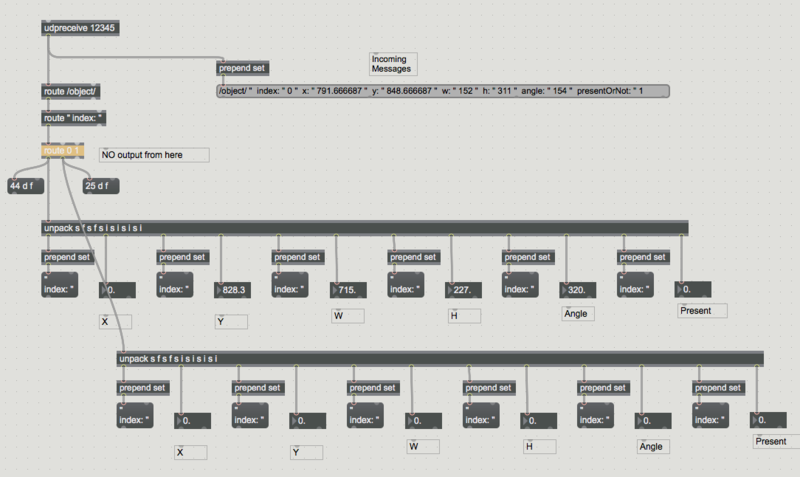 But when I try to apply it to my own with incoming udp messages, no messages come out of the [route 0 1] object. Am I doing something really silly here? Thanks MZED. I have a similar issue with trying to implement expand your suggestion for my intended purpose with many more that x1 "thing" messages coming in. I'm not sure what to do after [route 0 1]. By the way, to illustrate my points, I realise that I'm posting screenshots. Let me know if I should post code instead. Try with: [route " index: "] Looks like there are two spaces prior to the word index.